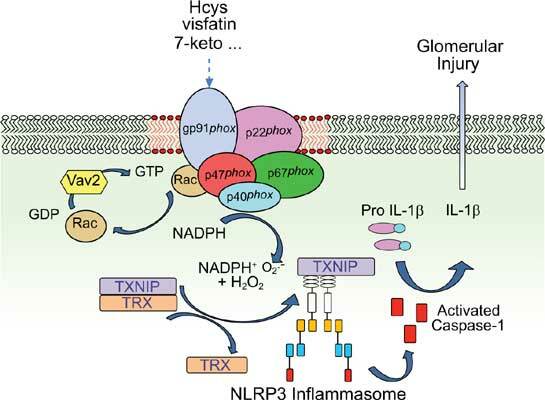 Background: The intracellular multiprotein complex termed the inflammasome functions as a platform of pro-inflammatory cytokine production such as IL-1β and IL-18. Under certain conditions, however, the inflammasome produces non-canonical effects such as induction of cell death, pyroptosis and cell metabolism alterations. Objective: In mammalian cells, several types of inflammasomes were identified, but the most widely studied one is the inflammasome containing NOD-like receptor with pyrin domain 3 (NLRP3), which has recently been reported as a central pathogenic mechanism of chronic degenerative diseases. Many activators or risk factors exert their actions through the activation of the NLRP3 inflammasome to produce a variety of functional changes in different cells including inflammatory, metabolic or survival responses. Several molecular signaling pathways are shown to mediate the activation of the NLRP3 inflammasome, and they are related to the modifications in K+ efflux, increased lysosome leakage and activation of cathepsin B or enhanced reactive oxygen species (ROS) production. In the kidney, inflammation is believed to mediate or promote the progression of glomerular sclerotic pathologies resulting in end-stage renal disease (ESRD). NLRP3 inflammasome activation may turn on glomerular inflammation and other cell damages, contributing to the onset of glomerular injury and ESRD. This inflammasome activation not only occurs in immune cells, but also in residential cells such as endothelial cells and podocytes in the glomeruli. Summary: This review briefly summarizes current evidence of NLRP3 inflammasome activation and related molecular mechanisms in renal glomeruli. The possible canonical and non-canonical effects of this inflammasome activation and its potential implication in the development of different glomerular diseases are highlighted. Keywords: Inflammation, glomerulosclerosis, inflammasome, homocysteine, diabetes mellitus. Keywords:Inflammation, glomerulosclerosis, inflammasome, homocysteine, diabetes mellitus. Abstract:Background: The intracellular multiprotein complex termed the inflammasome functions as a platform of pro-inflammatory cytokine production such as IL-1β and IL-18. Under certain conditions, however, the inflammasome produces non-canonical effects such as induction of cell death, pyroptosis and cell metabolism alterations.